Christ in the Old Testament | The Old Adam Lives! This one is a great one to send to your Mormon friends. Also, your Baptist, non-denominational, Pentecostal, Calvinist, Methodist, and Catholic friends. Also, Pastor Mark explains why we are NOT dispensationalists. And thanks to flickr and returntogodsgarden, for the photo. 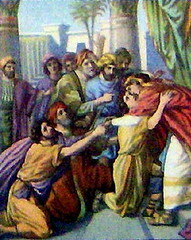 It’s a painting of Joseph forgiving his brothers. The message (class) is for EVERYONE!